A boutique landmark Port Coquitlam real estate development is taking form here at Carmandy Condos. Situated in downtown Port Coquitlam Carmandy condos are both affordable and well built. Contemporary styles, colours, textures and exteriors are all selling features for homebuyers looking for the convenience of downtown Port Coquitlam condo living. These well designed homes by Parklane Group will provide a great new home for a select number of home buyers here at the presale Carmandy Port Coquitlam condos for sale. Best of all, the Carmandy Condominiums are now complete and all ready for occupancy, so there are no waits. Elegance you can call your own is now here as the tag line explains. With location being the primary requirement for purchasers, the Parklane Carmandy Port Coquitlam condos certainly has its downtown locale going for it. Close to major highways/thoroughfares in addition to an abundance of transportation routes, homebuyesr at the Carmandy Port Coquitlam condo community will be in and out of the Greater Vancouver area very quickly. If you don’t want to pay an arm and a leg for a tiny downtown Vancouver condominium, then the Port Coquitlam Carmandy condos for sale will certainly give you a better option based on value and capital appreciation over time. There are also great financing packages and mortgage rate incentives provided by the real estate professionals here at Carmandy Condos, so don’t hesitate to ask them about how you can save big right away. Pre-registration is now underway, so make sure you visit their online website at www.carmandy.com today for more information and their blog news update page. You can purchase a new Port Coquitlam condo today and move-in the next. Beat the HST as there is no HST on any of these new Carmandy Condos for sale. Take advantage of these special incentives and save thousands of dollars right away! Now selling and move-in today into these newly completed Port Coquitlam condos for sale. Boutique PoCo Carmandy condos total only forty one residential suites located at Shaughnessy and Atkins. Right now, previewing and sales is open weekends from 1 to 4pm by appointment only. The Carmandy Port Coquitlam condos feature one bedroom plus den units from just $215,900 as well as presale PoCo two bedroom suites from $263,900. The presale Carmandy Port Coquitlam condos combine contemporary floor plans with large windows maximizing light exposure, granite countertops, thick laminate flooring and solid maple shaker cabinetry. In addition, these new PoCo condos will feature high-end stainless steel appliances and much more. From the large ground floor patios to the panoramic Port Coquitlam penthouse suites for sale, there’s something for everyone here at the Carmandy Condos in PoCo real estate market place. Elegance you can now call home. Featuring a great location at 2373 Atkins Avenue, Port Coquitlam Carmandy condos are now selling and include the 2-5-10 Willis Canada Home Warranty so that you are 100% covered. Brought to the market by VMG Project Marketing and The Parklane Group, please contact John or Fred today for more information abou the newest release of completed Port Coquitlam condos for sale at Carmandy condominiums. You may also visit www.Carmandy.com for all the latest news from the development blog as well as registration information to get on the VIP list for presales. Please note that the Parklane Group is not the same as ParkLane Group, another Vancouver real estate builder. The design and elegance of the new PoCo apartments for sale at Carmandy are seen throughout the renderings and interior photos of these affordable homes. With solid maple shaker cabinetry in the kitchens to stainless steel appliance set, these standards raise the bar in design and offerings in the PoCo real estate market. There is thick laminate flooring as well as oversized granite countertops in the kitchens. 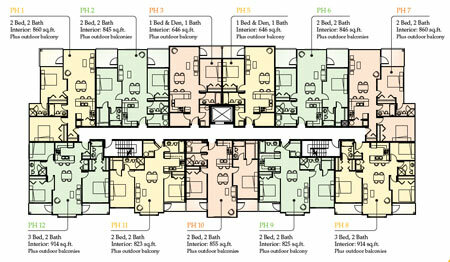 Also, logical and functional Carmandy floorplans are offered here at the new Carmandy PoCo apartment development. Large and full sized windows allow plenty of light into your living spaces and the penthouses will provide great views to homebuyers. On the first floor, the new PoCo apartments for sale range in floorplans of 1 bed/1 bath at around 650 sqft all the way to a very spacious corner three bedroom and two bathroom layout over 950 square feet in size. The Carmandy Condo penthouse level of these new PoCo apartments for sale range in 1 bed plus den suites all the way to the corner 914 sqft 3 bed/2 bath units. Most of the Carmandy floorplans have outdoor spaces and all suites have in suite laundry. Best of all, the new PoCo apartment building is now complete, so homebuyers can purchase a new suite and move-in right away. There is GST applicable on all purchases, but you can beat the BC HST if you purchase a new Port Coquitlam Carmandy apartment today! Now Selling! The Carmandy PoCo Apartments are Move-In Ready! Buy Today and there will be absolutely no waits for you to take occupancy here at the new Carmandy PoCo apartments for sale. Purchase a new Port Coquitlam condominium right now, move in and pay NO HST. These are impressive incentives for this boutique low-rise developmenty by the Parklane Group that is being marketed by VMG Project Marketing. Located at 2372 Atkins Avenue Port Coquitlam the Carmandy Apartments feature three bed and two bath floorplans at around nine hundred and fourteen square feet from the $275k range! The two bed and two bath layouts at the new Carmancy Port Coquitlam apartments for sale are around the $260k range while the smaller one bed plus den (646 sqft) suites are in the low $200k. This is great Port Coquitlam real estate value and it comes at a time before you need to worry about the BC HST and the long pre-construction waits. Elegance you can now call home, these contemporary PoCo apartments at Carmandy Port Coquitlam are now previewing and selling. All homes will get the 2-5-10 Willis Canada Home Warranty too. They are open on Saturday and Sunday from 1-4pm or you can book an appointment with Fred or John at any time. City savvy homebuyers are flocking to the new downtown Port Coquitlam condos for sale at Carmandy today. If you purchase before July 1st, you won’t have to pay the BC HST too! Close to the West Coast Express, lots of shops and dining options, schools, recreational community centres and outdoor parks, the new Port Coquitlam Carmandy condos for sale are turning heads and attracing new homebuyers. Large and airy spaces, functional layouts and large suites are presented here. For first time homebuyers, these new Carmandy Port Coquitlam condos for sale are very affordable and the range of housing layouts is outstanding. With full stainless steel appliance kitchen set in addition to granite counters, oversized windows, spacious three bedroom to ground floor with patio floor plans, it is no wonder why many of these new PoCo Carmandy apartments have already been sold out. Already finished and ready for occupancy, new homebuyers can lock in today’s lowest mortgage rates and beat the BC HST as well. Not only that, but new homebuyers can also move-into their new Carmandy Port Coquitlam condo today! A quiet and friendly neighbourhood awaits you and your family, and this mega shopping area of Coquitlam Centre coupled with lots of schools for all ages, make this an ideal place to live and work. Prices for these homes start from just $215,900.